The mother of the Children of the Sun is said to have woven the first spruce-root basket, in which she and her offspring were lowered to Earth. 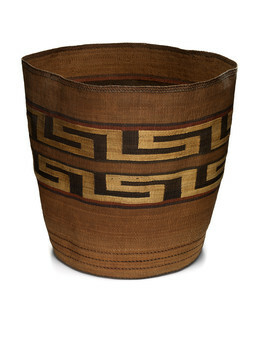 The northern Tlingit were renowned for tightly woven baskets that were “just like wood” in their rigidity and strength. This basket has a classic watertight weave with three-strand twining added around the rim for strength. Weavers inserted dyed grasses, maidenhair fern, and other plant materials into the weft to make decorative patterns. The “blanket-border” pattern comes from Hudson’s Bay Company trade blankets. Teri Rofkar: So, usually a Tlingit basket has the three bands. Many times these two [outer bands] are the same. And then the one in the middle is different, yeah . . .
It’s two strand twining, primarily with the spruce roots because that’s what we had, the spruce roots . . . there’s two weft elements, the ones that go across and these spokes are the ones sticking up are warps. . . . So, the warps aren’t’ manipulated so, it’s all kinda in your hands . . . When they did this the grass was lighter colored and the roots were almost exactly the same color as that grass so this little red band before and after the design would’ve given you that pop . . . Now red is dyed spruce root. . . The red would have been alder bark originally. The bark would have been hemlock bark . . .
And what I’m always amazed at is so many of the great big baskets that I see have huge bunch of grass design elements that are wrapped weft. What you do is you actually every time you weave when the weft element comes to the outside of the basket I wrap it with the grass and then I weave again and then I warp this one [the new weft element that came to the outside] with grass and then I weave and I wrap that. That’s why you don’t see it [grass] on the inside because it never goes into there, I just keep it on the outside . . .
Look at it, to completed it you’ve gotta have a set number of rows and that’s not flexible. And in your sequence you’re gonna do those twice [upper and lower pattern bands] and you’re gonna have one in the middle. This is always the floating pattern [middle pattern], this one is a pattern that is complete no matter what size it is [on the basket] so this is where you make up [overlapped by other speaker] where you decide how big you basket is going to be [in the middle pattern] . . . When they did this the grass was lighter colored and the roots were almost exactly the same color as that grass . . . So here are these really ornate patterns that when you get done with them you know [that] in about forty years they are going to be awesome, but right now not so much. . . .You’re looking at a basket who has faded because of the age of the roots, not because of the treatment they’ve had. Audience: Do you harvest your own fibers, spruce fibers? Teri Rofkar: Do I harvest my own spruce root? Yes, I do. You can’t purchase it anywhere, so yeah, I do harvest my own spruce root I go out in the spring and get the spruce roots . . . it’s like a strawberry runner. And I pull those out. They’re long and straight. They can be up to 30 to 40 feet. Usually adverse soil conditions are best. And they kind of are a lateral root that help the tree with stability for wind. They’re pretty unique to kind of the coastal Alaska and down to northern California. So these kinds of roots were used for that purpose. But you’re exactly right I do go out and dig them every year. Audience: How big are they? Teri Rofkar: Much smaller than my pinky . . . but the size of the root dictates the size of your weaving . Audience: So, you don’t weave too much with cedar bark anymore? Teri Rofkar: No, I still have a relationship with it, but it’s different . . .because if you look at it on a microspcopical level cedar bark looks like a kitchen sponge. Basically, it’s all full of holes, its whole purpose is to bring moisture up the tree, pumped full of syrups and sugars and all those things so it’s, yeah. It will never be water tight no matter how hard you pull it, where as if you look at the spruce root that’s got a wood composition, it’s smooth, it’s a tight grain and cell structure and it’s going to be water tight . . . Audience: Do you split the [spruce] root? Teri Rofkar: And yes, I do split the root. Within two hours of digging it out of the ground, I burn it in a hot fire. I pull it through an eenaa, which is a stick with a split in it. And then I start splitting it. And I don’t use a tool, I use my hands and my mouth, because I need to follow the grain of the wood. Audience: How deep do you have to go for these roots? Teri Rofkar: Just under the surface these are really close to the top, you just pull the moss back, yeah so . . .With the exception of, I’ve always known that — over the years harvesting that when it is really cold and there isn’t a lot of snow cover the root will go deep. . . Particular lateral roots they grow just under the snow and they grow at such a rate in the spring under the snow, they grow five feet a month, so when it’s cold they have that opportunity to really just take a dive. Teri Rofkar: These big baskets were the big berry baskets. Outside of the bush you would have a small one you would wear around your neck and then you’d dump it into [the big baskets] after you picked. Yeah, they were pretty good. I actually find that these big berry baskets were probably the ones with the most ornate and complex patterns of all the baskets it wasn’t the crest hats, but it was these great big berry baskets, yeah. Like this midsize, not the very biggest burden baskets like the mother baskets, but these ones definitely.